If you have a budding gymnast at home, there are a lot of products out there that are sure to delight. One piece of equipment your child will love is a horizontal bar for gymnastics. You may be wondering how to pick out the right product especially if you’re buying online. Don’t worry, we’ve got you covered. 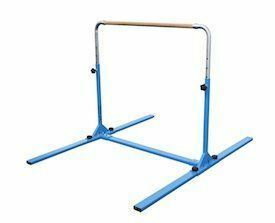 We found 6 exceptional gymnastics bars for home use and we will help you pick out the right one for you. To help you decide which one is right for you, we broke it all down into segments. First, we will tell you what our top recommendation for best home gymnastics bar is. Next, we’ll give you a chart that will compare the gymnastic bars for home. Then, we will give you reviews on all 6 top products. 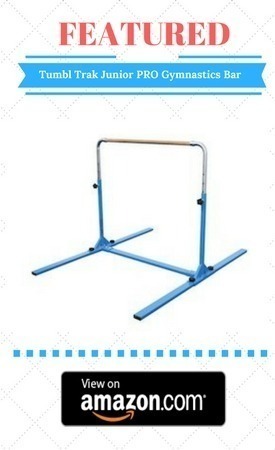 Our top product is the Tumbl Trak Junior PRO Gymnastics Bar. This adjustable gymnastics bar is one of the best bars we’ve seen. It’s definitely the best home gymnastics bar we’ve seen for this year. It gets good reviews across the board. We’ll explain why below. But first, we’ll show you the comparison chart. The Tumbl Trak Junior Bar PRO is a top of the line training bar for home gymnastics. The Jr. Bar PRO only takes up a 4' x 6' space on the floor. It features an extremely durable 1-1/2in solid maple bar with heavy gauge steel tubing to make sure that it's the highest quality bar on the market. As the bar is stable enough on its own and requires no additional stabilizing mechanisms, kids feel incredibly stable as they swing on it without requiring any additional base extensions. The Jr. Bar PRO is also extremely easy to set up and can be done in approx 5-10 minutes. The D-2 Knobs make it easy for anyone to adjust bar heights that makes for quick transitions between skills. The rounded corners safety features help to keep the athletes safe and give them more confidence to progress. Being the bar that is the easiest to assemble and disassemble, this extremely versatile single bar is great for all skill levels and ages in the gym or at home. The Tumble Trak Junior Kip Bar, in purple was our favorite for many different reasons. First, it is a tremendous value. 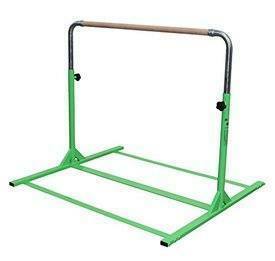 The solid beech bar and heavy gauge steel construction make this a high-quality gymnastic bar. Beech is a great choice for the bar because of the right balance between strength and flexibility. 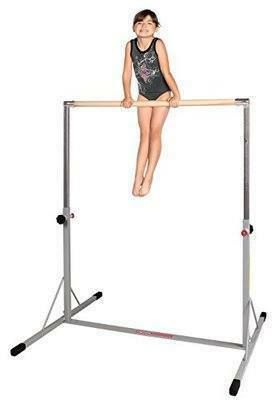 Heavy gauge steel ensures that the gymnastics bar will be sturdy enough to hold your child. The size of the bar is particularly good for small hands. Some were a little bigger, but this one seemed to the right for a larger age group. Also, the beech wood used to make the bar is a really good choice. It’s a solid and strong wood with just enough flexibility. Wood that isn’t flexible may be too brittle. That’s why we liked this bar and this wood. The frame of our favorite gymnastics bars for home is made of heavy gauge steel. That means it won’t bend during normal use. It’s safer than low gauge steel or aluminum. It’s also very stable. There was no wobbling when our gymnasts completed their exercises. The height is also something you may want to consider. Some bars are too short for kids that aren’t above preschool age. This bar can adjust to a higher level. Also, the bar didn’t need to be sanded to make it smooth enough for use. We always keep sand paper handy for when we get new wooden equipment, but it wasn’t needed in this case. As the child grows and improves, you can also add extension kits which is sold separately. Another bar we like was the Z-Athletic Gymnastics Expandable Junior Training Bar. This bar is heavier than some you might see on the market and that’s a good thing. It’s indicative of the unusually strong construction. Made of heavy duty steel, the frame is very strong. Add to that the wood/fiberglass construction of the bar and you know that this a high-quality piece of equipment. The bar is more than an inch and a half diameter. Be sure that’s not too big for your gymnast’s hands. Most of the bars we tried were 1.5 inches. We got the extension kit that’s sold separately because we have gymnasts of various heights. We strongly suggest getting the extension kit because it also comes with stabilizers. It makes this bar much easier and safer to use. Our gymnasts liked this bar and it was very sturdy. We didn’t feel that it was completely safe without the extension kit, so we never tried it that way. That being said, it was tall enough for our gymnasts up to age 10. That’s better than some other bars that are not expandable. We liked this product and recommend it as long as you also buy the extension kit. The Joom Beem Pink Adjustable (3’-5’) Horizontal Bar and 8ft Folding Mat Balance Beam Combo Gym Set is another one that our gymnasts liked. The set we received did not come with a mat and we didn’t get one in time for the review. The bar was our primary concern, however. The bar in this set is adequate. We measured the bar diameter at 1.5 inches, but that wasn’t listed in the specifications. So, we didn’t put it in the comparison table on the chance that they sell more than one size under the same product line. We sanded the bar before letting our gymnasts give it a try because it looked a little rough. After that, though, it was good to go. The manufacturer didn’t specify the type of wood used in this bar. We thought it might be maple, but since they didn’t list it, we fear it might not be standard. So, we’ll just say that it is a wooden bar and that it’s a little rough. After some sanding, it was ok. The quality of the bar was better than we expected. We had seen some reviews and wondered if it would even be safe. However, the one we got was level and the welds were solid. The Norbert’s Athletic Products Gymnastics Mini Bar is another one our gymnasts liked. It’s adjustable so a wide age range of gymnasts can use it. It is recommending for gymnasts up to 100 lbs. We didn’t have any gymnasts over that size so everyone got to give it a try. The maple bar didn’t need to be sanded like some others we tried out. The structure was well made. We were able to use one of our regular mats for this, which was helpful. Having to buy a custom mat is a pain. We feared that it wasn’t stable enough because of the narrow base so we added width with some pipes. After that, there was no stability problem. There may be no stability problem on the lowest setting with a child that is not yet up to putting strain on the equipment. However, if your little gymnast does serious flips you might consider adding something to make it more stable. Our gymnasts really liked this bar. There were no splinters and the size was right for all of the little hands. We particularly liked the adjustable height and how easy it was to put together. It’s a nice bar even though it is a little unstable without some added pipes that you can get at a home improvement store. 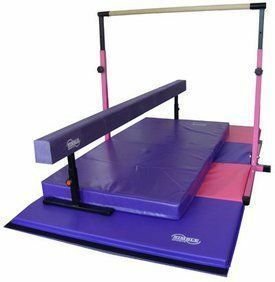 The Nimble Sports Little Gym Deluxe - Adjustable Bar – Adjustable Balance Beam – 8ft Folding Mat – 6ft Landing Mat was another one our gymnasts liked. It was our favorite that came as a combo set. All of the pieces were included and it has an adjustable bar. Like most of the bars, we tried it has a weight limit of 100lbs which is not really an issue with young gymnasts. The balance beam has a weight limit of 150lbs so a few adults tried it out and it was stable and well made. We sanded this bar a little just to be sure that our gymnasts didn’t get splinters, but we didn’t need to do anything else to adjust it. The base on this bar didn’t need any additions to make it more stable. It comes with braces to make it safe. The price of this product may seem high, but it is high-quality. It is big enough for kids up to 10 to enjoy and the set as a whole is great. We highly recommend this product. Height- It’s important to look closely at the height of the bar you will be buying. Many of these bars are best for kids 10 and under. If they aren’t adjustable or expandable, they might be too small for an 8-year-old. Bar width- Bar width comes into play with smaller kids and smaller hands. Make sure the bar is small enough that your little gymnast can get a good grip. Weight- Weight restriction is very important to choose a right equipment for your child. You definitely don’t want a bar that isn’t strong enough to hold your little gymnast. Many companies will limit their equipment to around 100 lbs. The lower they are below the weight, the more higher level exercises they will be able to perform so be sure that your children weigh less than the maximum weight. Bar material- Bar material is important because the bar needs to be flexible and strong. Beech is a good wood for this kind of bar. If the manufacturer doesn’t say what kind of wood they use, they may use whatever is cheapest. You might still be ok buying that gymnastics bar, but it is better to know the type of wood. Extra items included- Some bars for gymnastics come in combo sets. That may be a good value or it may not. A cheap combo set is likely made of cheap material. The manufacturer gives you a lot of items to make it seem like a great deal, but the quality of the individual items is important. A low price that seems too good to be true likely is. Base width- The width of the base is important because that’s where the stability is. 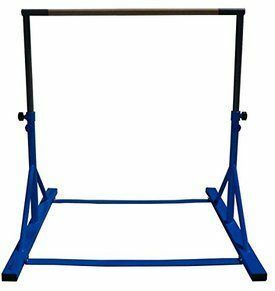 You can buy a bar with a narrow base and expand it yourself if you need to, however, it is probably better to buy a gymnastics bar with a wide enough base, to begin with. Structure- A gymnastics bar on a weak structure can be dangerous. Check to see if it’s level, if not, there may be a bend somewhere. Also, look at the welds on the gymnastics bar’s frame to make sure they’re sturdy. Mats- Bars should never be used without a proper mat underneath. Some bars come with mats, but if they don’t, you should buy one separately to have in place to protect your young gymnast. Look at the dimensions of the product you’re buying to find the right size mat. In conclusion, it can be difficult to choose the best gymnastics bar for your home needs. To ensure that you’re buying a worthwhile product, it’s very important that you get a good idea of the functionality of a gymnastics bar before you make a decision. The utmost quality of the material and the bar itself is possibly your top consideration. Support structures must be stable enough as the athlete spins and twirls on them so it’s important to make sure it is in fact trustworthy. Among all of the products we’d reviewed above, we strongly recommend the Tumbl Trak Junior PRO Gymnastics Bar for home due to its many advantages as mentioned earlier. Matching the weight and the skill level of your gymnast will provide the best value for your money. If you are planning to buy a gymnastic bars, we hope that this guide has been helpful for you in choosing your gymnastic equipment. Copyright text 2018 by Fit2bMom.